• 20.4 Grams of Protein! • A whopping 20.5 servings per pound! • 19 Grams of Protein! • Only .4 Grams of Fat! This Micellar Casein is packed full of protein with a nice BCAA ratio and is very comparable in quality with our whey protein isolate in terms of nutritional value and is guaranteed to be the freshest and purest non-denatured Micellar Casein protein available. Our unflavored Micellar Casein protein contains an amazing 20.4 grams of the highest biological value protein per 22 gram serving. This protein powder is the highest quality Micellar Casein protein available period. Ingredients are 98.5% Micellar Casein and 1.5% or less lecithin for mixing in drinks. No Artificial Sweeteners and Virtually Lactose Free: This is the purest non-denatured Micellar Casein protein available. Made from 100% American USDA Grade A milk. This product contains no artificial sweeteners or flavors of any kind. Our Micellar Casein protein is manufactured using a 100% cold temperature process, which keeps its micro-fractions intact and protects the integrity of the amino acid profile. Other than Micellar Casein protein which comes from milk, this product contains no animal-sourced ingredients. • This supplement contains absolutely NO additives, sweeteners or other fillers or agents that many manufacturers use to dilute their products. • Compare the amount of protein in our products by multiplying the total number of servings times the amount of protein per serving and you will understand. • Muscle Feast, LLC supplements are manufactured under the strictest HACCP, FDA, and Kosher standards, producing the highest quality and purest supplements available. • Our raw ingredients undergo state of the art analysis to ensure zero impurities and strict adherence to product labeling. When it comes to price and quality you can’t beat Muscle Feast. We guarantee it! How can our Quality be so high and our prices so low? We are able to keep our pricing so low because we are a relatively small manufacturer with very low overhead and we sell direct to the public. • Freshly manufactured – not expired or closeout Spoon mixes with no gritty taste or residue. • Our unflavored proteins contain no fillers, just a small amount (up to 1.5%) of lecithin to allow the products to mix in fluid. • If you are trying to gain weight, you should take about 1.5 to 2.0 times your body weight in grams of protein; i.e. if you weigh 175 pounds, you would want to get about 260 to 350 grams of protein per day. This is your total protein intake and needs to include all your daily sources of protein. If you are not trying to lose weight, the general rule is a ratio of about 1. • You don’t always need to take a full scoop and sometimes you might want a little more than a full scoop. 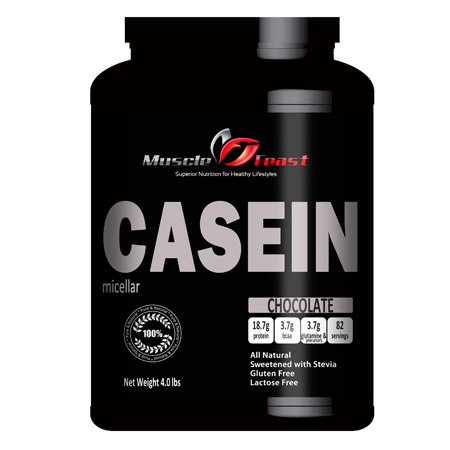 • Micellar Casein protein is a slow acting protein, meaning it is very good to take before bedtime or when long durations between meals are anticipated. Highest quality Micellar Casein available. This product contains only micellar casein and less than 1.5% lecithin.